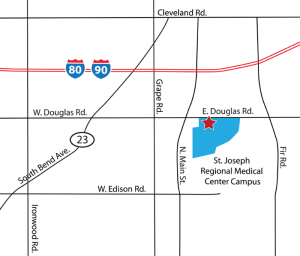 XRC Interventional Radiology and the Legacy Vein Clinic offices are at the St. Joseph Regional Medical Center Mishawaka campus. The location provides easy access to X-Ray Consultants’ Interventional Radiologists, known for their varicose vein treatment procedures, as well as the growing number of minimally invasive procedures they perform at the hospital. Visit us at our Douglas Road address if you are having an IR consult or Vein consult/procedure. If you have questions about where your consult or procedure will be, please call us at (574) 968-0358.